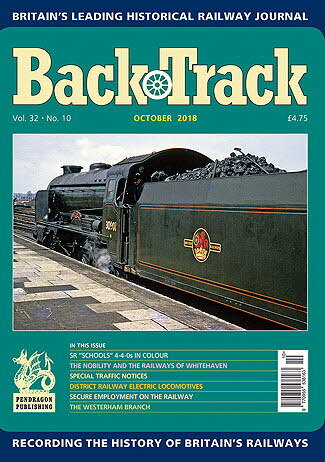 Railway Magazine | BackTrack October 2018 journal from Pendragon Publishing. Diesel transition in Scotland - Colour feature from the early 1960s by David Idle. One Lord and no Dukes: the nobility and the railway of Whitehaven - by David Joy. Secure Employment on the railway - Alistair F. Nisbet looks at some reasons why that was not always the case. A Manchester, Sheffield & Lincolnshire Railway Trio - three archive photographs by Dr. Tice F. Budden. Aspects of Ambitious Schemes 1867-1879: Part Two - Jeffrey Wells's article concludes by focussing on the Barmouth and Runcorn Bridges. Heat and Safety - Peter Butler offers a brief glimpse of track working in 1979. West Riding Wanderings - four-page colour feature by David Rodgers a various locations around Leeds and Bradford. School Photographs - three pages of colour of the Southern Railway's outstanding 4-4-0 locomotives. Passengers and Pigeons: Glen Kilday examines a 1962 BR North Eastern Region Special Traffic Notice and its operational instructions. Francis Whishaw - Railway Writer: a brief biography by Jeffrey Wells. Edward Bury's first sixteen locomotives: Untangling the historical record - Pete Claussen tracks down the identities of early locomotives exported to America. Shunting in Salford and Manchester - archive photographs from the Alan Tyson Collection. Accident on the Oxford, Worcester & Wolverhampton Railway - a 'train breakage' collision from 1858. The Electric Locomotives of the District Railway - described by Michael J. Smith. What the Butler saw - Peter Butler recalls taking a high-level view of Cricklewood. A Kent branch line in the 1950s - John Chapman shares his memories of the Westerham branch.